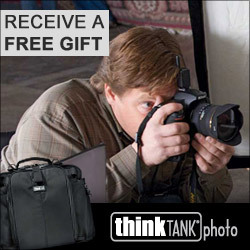 Hey gang, just a very quick post to let you know about some bags from my friends at Think Tank Photo. I love all my Think Tank bags and recommend them over everything else that I have seen in the marketplace. One of the bags that I use a great deal myself is the Streetwalker Hard Drive. It's big enough to take a pro level DSLR with battery grip and the requisite lenses and extra kit needed for a job or short trip. It's what I hauled my kit in during my trip to the Nevada desert. The new bag is called the Streetwalker Roller which adds a set of Think Tanks tough and reliable wheels to the bottom of the bag, ideal when you need to drag the bag through an airport or similar situation where having it on your back is not optimal. There's also a new Streetwalker 2.0 bag that is worth having a look at. Follow this link to be taken to the page to view these new bags. In the same announcement came news of new versions of the excellent Turnstyle sling bags, now all in version 2.0. The come in three different sizes and are perfect if you want to carry a mirrorless kit or DSLR kit that is out of the way when you are walking but can quickly be swung around at waist level for gear access. You can see the new Turnstyles here. The bags are available in black or blue to suit your personal taste.